Sheet Size: 315x303mmChip Size: 15x15mm, 15x48mm, 15x98mmThickness: 8mmShape: StripUsage: Backsplash & WallColor: Blue and GraySold by: SheetFinish: Glossy, easy for..
Stone glass tile kitchen backsplash cheap gray marble bathroom flooring designs blue crystal glass mosaic wall subway tilesSheet Size: 300x300mmChip Size: 23x48mmThickness:..
Mosaic tile is used to decorate your home which could give a new look to your space. 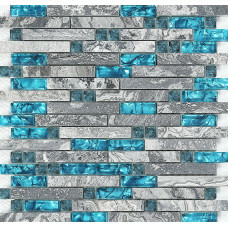 Glass mosaic tiles are easy to apply, they can be used to decorate any corner of your house. Mosaic tile is considered to be a unique technique that can be used for various purposes and a technique that would provide you all comforts of your life, they would help you to fulfill your dreams. Mosaic tiles including glass mosaic tile, stone mosaic tile, porcelain tile, mother of pearl shell tile, stainless steel metal tile that are usually used in showers as bathroom tiles and on floors as floor tiles to add a lot of color and style to the room. Mosaics can be found in a large number of textures, colors, layouts and shapes so that if required, you could customize every room in the house. Mosaic tiles are not only a form of tiling, glass mosaic tiles are also sometimes even considered works of art. Most glass mosaic tiles are suitable for both internal and external applications, as they are impervious to frost, sunlight, and water. They are easy to clean, maintain, and they never discolor, making them perfect for a tile backsplash or other high-use areas. They will continue to keep their dazzling appearance for many years to come. Glass tiles can be used in a virtually unlimited range of applications: kitchen backsplashes and walls, bathroom backsplashes and walls, showers, borders to soften conventional ceramic tiled walls, highlight external building features, and garden walls, pools, spas, waterfalls, and any applications to suit your imagination. Bravotti stocks a large range of different color styles and sizes. Any item, which is not a stock item can be custom made to suit your taste and requirements.